There is still a misperception in the media that only the CDS market can afford significant amounts of leverage to risk takers. Tremendous leverage is in fact available via repo, a market far larger than CDS. The media often misses the fact that MF Global failed because of repo based leverage. And by the way so did Lehman and Bear Stearns and Merrill Lynch - all failed because they could not roll their repo loans. That's why repo markets are of critical importance to the financial system and need to be well understood by policy makers. It's amazing that a typical US politician knows more about the Kandahar Province in Afghanistan than what a repo transaction is. Data on repo markets is difficult to come by. Recent report from Fitch sheds some light on the latest developments in that market. 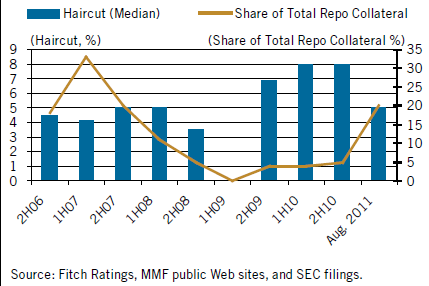 Repo haircut (initial margin) - a key measure to track in these markets - obviously depends on the type of collateral. According to the report, treasuries tend to have a 2% haircut these days, while corporate bonds are 5%. That's 20 to 1 leverage. 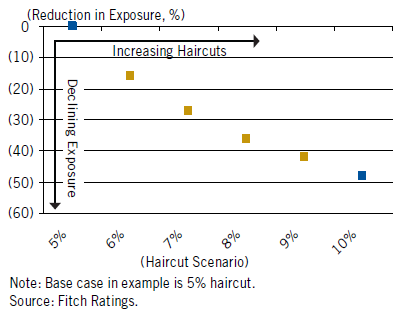 Haircuts for high yield bonds are higher (15-25%) and equities haircuts are around 50%, but vary with the volatility in the market. (There are other ways to leverage equities such as total return swaps.) Just for illustration, the diagram below shows how repo leverage can force asset sales if haircuts are increased from say 5% to 10%. Increasing haircuts is all it took to put MF Global out of business. One recent development in the repo market has been the return of structured credit such as RMBS securities as collateral in repo transactions. Three years ago leveraging structured credit bonds in the repo market was impossible. Triparty repo eliminates counterparty risk that exists in a bilateral repo transaction. As concerns about counterparty risk increased in 2011 with fears of US banks' exposure to the Eurozone, the usage of triparty repo rose. The repo market continues to dominate short term funding in the banking sector in Europe, with unsecured interbank funding basically dead across the Eurozone. Also with new derivatives regulation pushing CDS into central counterparties (clearinghouse), repo based leverage becomes an even more attractive way to put on risk. Following such developments in the repo markets will be increasingly important to understanding the health of the financial system.